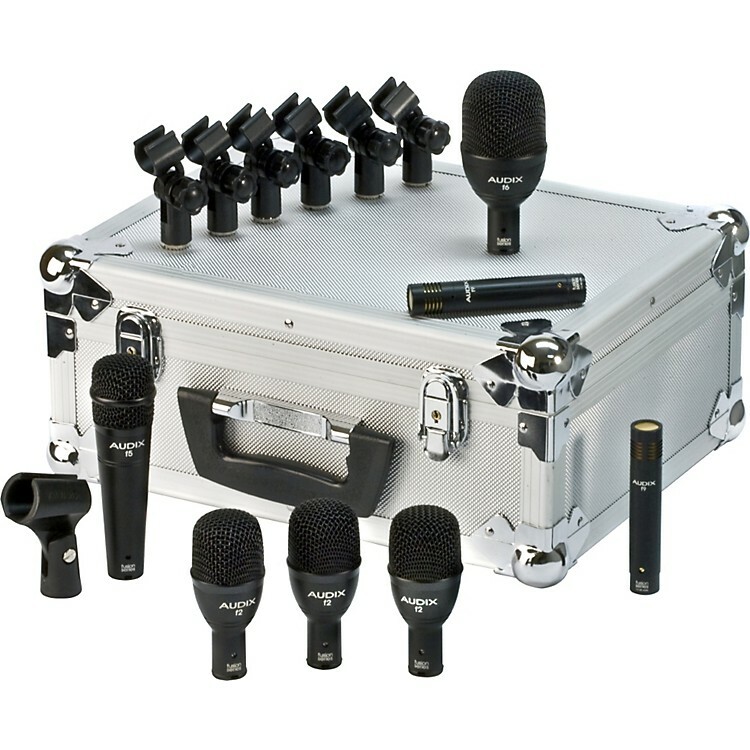 A pre-packaged set of high quality drum microphones for the professional. Audix has revolutionized drum and percussion miking by designing specific mics for specific instruments. The Fusion Series microphones, which are designed, assembled, and tested by Audix in the USA, fulfill all the performance criteria required for professional stage and studio applications. These prepackaged sets of microphones offer convenience, quality, durability, and affordability. All mics come with high-impact mic stand adapters and are packed in a heavy-duty foam-lined aluminum carrying case for safe keeping when the products are not in use. The f5 is characterized with a hypercardioid pickup pattern for isolation and feedback control and is equipped with an LM Type A (Low Mass) diaphragm for natural, accurate sound reproduction. The f5 is sturdy, compact, and easy to position. With a wide frequency response of 55Hz-15kHz, the f5 provides clear, accurate, natural sound reproduction without having to rely on EQ. The f2 is characterized with a hypercardioid pickup pattern for isolation and feedback control and is equipped with an LM Type A (Low Mass) diaphragm for natural, accurate sound reproduction. The f2 is lightweight, compact, and easy to position. With a wide frequency response of 52Hz-15kHz and the ability to handle sound pressure levels of 139dB. The f6, which is characterized with a hypercardioid pickup pattern for isolation and feedback control, is equipped with a LM Type A (Low Mass) diaphragm for natural, accurate sound reproduction. The f6 is lightweight, compact and easy to position. With a wide frequency response of 40Hz-16kHz and the ability to handle sound pressure levels of 140dB, the f6 is an excellent choice for miking kick drum and instruments requiring extended low-frequency reproduction such as large toms and bass cabinets, leslie bottom, and cajons. The f9 is a professional pre-polarized condenser microphone used for stage and studio applications. It is known for its clear, accurate response particularly in the upper frequency range. The f9 features a 16mm pre-polarized capsule with gold vapor diaphragm and a frequency response of 40Hz -20kHz. This versatile mic is easy to position, durable and manufactured with high standards and tight tolerances. All the mics in the Audix FP7 Fusion Mic Package feature roadworthy construction that includes a precision cast zinc alloy body, black coat finish, laser etched model and serial number, steel mesh grill, gold XLR connector and a tension-fit heavy duty nylon mic clip.